"Ah have a dream, ma friends - a dream where ah see every square inch of this fair land covered by one big MacDonalds burger bar! "A dream where every American child - be normal or mutie - kin grow up without knowin' the horrors o' natural food! "Where every burger is served with pickle, an' every 'shake is so thick yu gotta drink it with a spoon! "Yes, ma friends, ah dream o' the day when all that's decent and American - Mom's apple pie, Hershey bars and the New York Yankees - yeah, everything that's decent and American... HAS BEEN WIPED OUT! "...And in its place will stand MacDonald's - one huge, onion-spangled MacDonald's - from sea to shinin' sea! "Enough speechifyin'. Let's eat! The burgers an' shakes is on me!" Yes, as Chris Lowder and John Wagner write in their forewords, between their 'speechifyin'' Ronald MacDonald, a scheming Colonel Saunders, a rampaging Jolly Green Giant and even the old Bibendum the Michelin man himself, it is astonishing that the <ahem> guest appearances were neither spotted and frantically scratched by the publishing higher-ups or attracted the subsequent attendant legal ire of the corporations squarely in the satirical crosshairs of Mills et al. 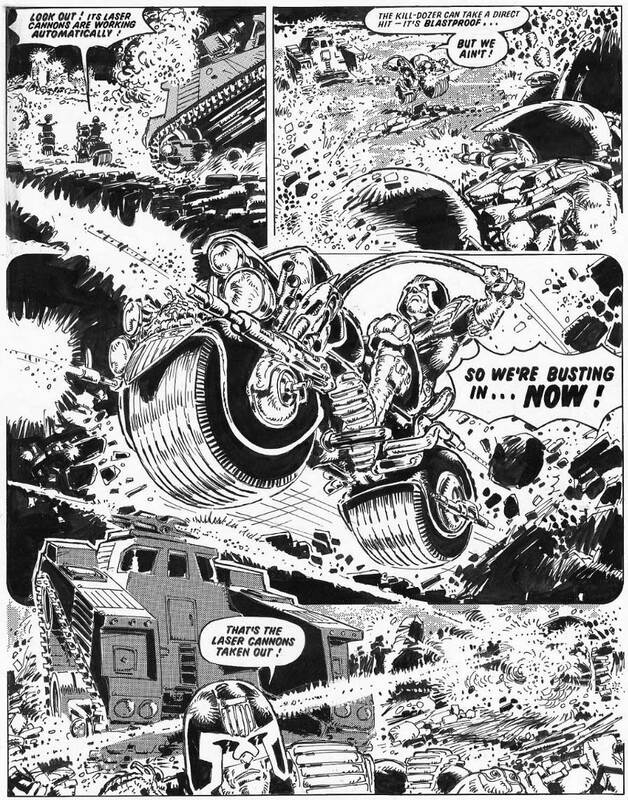 But then as they also point out, 2000AD was a very different beast back then in 1978 (this collection covers Progs 61-85! ), barely gestated and certainly not that well known. 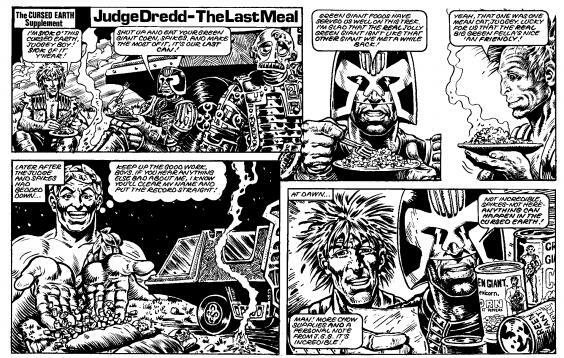 Hence though, having got away with it once, the potentially copyright-offending parts of this epic were expunged from subsequent collections of the Cursed Earth Saga, including JUDGE DREDD: COMPLETE CASEFILES 2, which sees Judge Dredd trying to cross the radioactive wastes from coast to coast to rescue Mega City Two from the raging Tooty Fruity virus turning citizens into cannibals. Presumably at this point, they have had permission to reprint them! 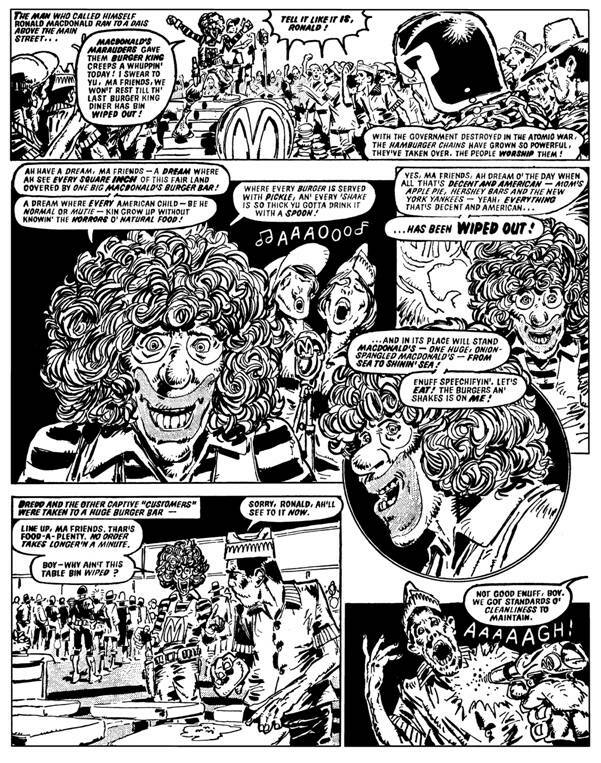 Though I actually recalled the retraction strip they printed at the time which features Dredd and Spikes Harvey Rotten and the 'real' Jolly Green Giant, which is included in the back matter here! 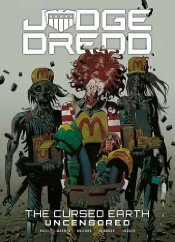 Extremely entertaining, iconoclastic (if you're a fast food fan, that is) brand-bashing aside, this is a classic bit of extremely early Dredd regardless as he battles through the Radlands encountering weirder and weirder resistance week after week, reluctantly assisted by returning villainous biker Spikes Harvey Rotten, even encountering 'Smooth' Bob Booth, the last President of the United States, along the way, whom the Judges sentenced to 100 years suspended animation for starting the Atomic Wars which resulted in their subsequent coup d'état. Current Dredd readers might find such early material a touch two-dimensional and the stories seemingly dashed off and practically joined together with sticky tape, but to me it's fascinating to look back and see how Mills even managed to get five pages of such exquisite madcap nonsense out on a weekly basis given the very, very limited resources he was working with. 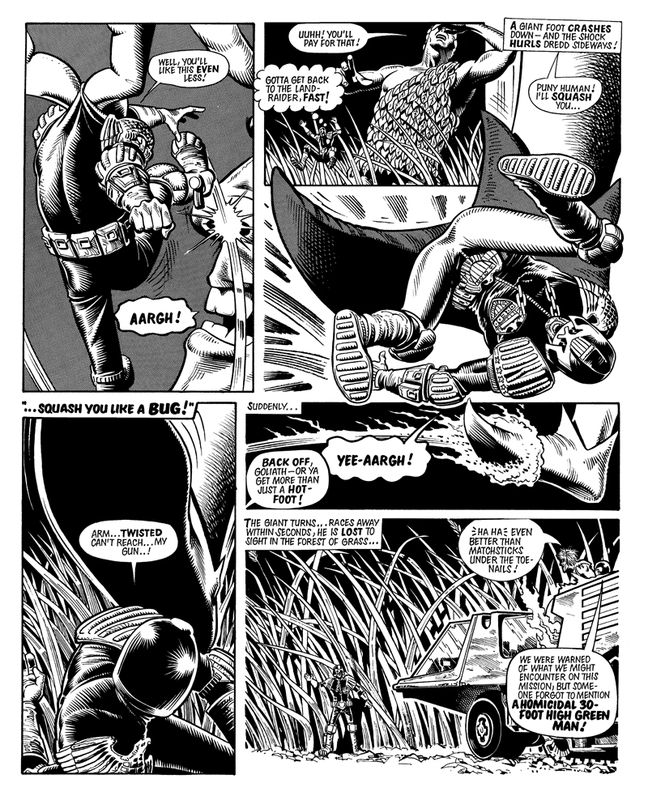 It's also amusing to observe the at times almost polite nature of the early more lithesome Dredd, drawn so beautifully by Bolland in particular here. There's certainly no such pleasantries from the hulking version of today as he heads gradually out of middle age towards drawing his pension!